The Compulsive Reader: Celebrating the Across the Universe Release! I blogged earlier today about the release of an amazing book, Across the Universe , which is happening today! When Shanyn and I went to GLIBA in October, we snagged copies of this one, and all of the Penguin folks were super excited about this one--and rightly so! It truly is an awesome sci-fi read, and Penguin has done an awful lot to celebrate--interactive websites, author videos, and more! Check it out! Explore the Godspeed on the official book site! It's so awesome--you can zoom in and take tours of each level and really get inside the book. I really liked the Feeder level--so much going on, and the way it's all spread out is neat. Also, today only, from 11:11 AM to 11:11 PM, io9.com will be posting a special 111 pages excerpt of Across the Universe! So if you think you might be interested in this book, go check it out! 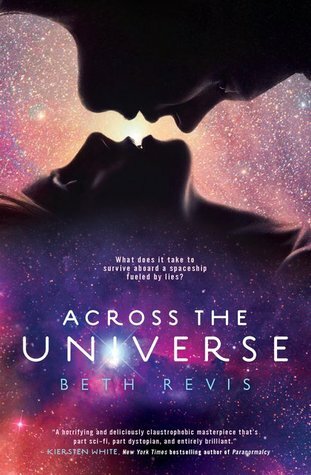 If you want to stay up to date on all Across the Universe news, become a fan on Facebook, check out Beth Revis's author site, follow her on Twitter, and check out the Penguin Teen site! Going to pick it up at the bookstore today! I'm super excited about this one. this book sounds great but I can't seem to find it at the library to read, and don't particularly like buying books do you know where I can find it? I am new to reading your blog and I just stumbled upon it. But it was great reading your blog. This post was fantastic! Katie: Enjoy! I saw a finished copy for the first time today at the store, and it is gorgeous! Belly: Well, it just came out today, so it probably isn't in libraries yet. Wait a week or so, and if your library still doesn't have, try asking for it through inter-library loan. Or, try paperbackswap.com or other book-swap sites. AR: Thanks for stopping by!